Binoy Kampmark does it again. Had the misfortune of witnessing a conservative Drum panel, led by Caroline Overington and Peter Van Onselen, trotting out the usual Pandora’s box of night terrors yesterday evening. Most our neighbours are the poorer for knowing us. Our “aid is usually of the Kopassus kind, whereby local kleptocracies arm their miltiaries to keep down the masses while they and their off shore friends plunder these places. One or two panelists did mention the silent double standard given the West’s history of interference in other nations affairs, but Overington howled down such protests- Israel, the US etc are our “friends” and villainy resides exclusively in the hearts of prospective opponents, right or wrong. But I get the feeling that many of our smaller neighbours would gladly throw us down tot he bottom story of a livestock ship, as neo colonialist boors kept in a fantasy world as to who we and they really are and what is actually needed. Read this before checking who was the author. Impressive analysis that pulls no punches – cuts to the point with razor sharp insight. I have no doubt this piece will ruffle many a feather – damned good contribution Binoy Kampmark. Australia doing what it does best. Looking after Americas best interests whilst ignoring our own. America could not have a more obedient and sycophantic servant looking after its interests. America got a war? Better still a war built on lies. The Australian L/NP government will offer up its youth and billions of taxpayer funds to fight for Americas best interests. How dare the Chinese even think about projecting military power into “our” region!!! The Pacific ocean is a Yankee lake, right up to China’s coast. God granted the US and her loyal vassal lap dogs, (with apologies to K9’s everywhere), like Oz, enjoy the divine right to rule as much of the world as the deep state chooses, which is all of the world. Just ask Malcolm!!! It’s okay for the Yanks to put troops all around China and Russia and in Oz to ensure we don’t elect a government that won’t follow their rules because they are ‘meriKKKans and they are the good guys. Ask any ‘meriKKKan leader and they will tell you that God is on their side. My only question is, “which god?” Probably the same insane deity who chose the sub-human scum slaughtering Palestinians I guess which has no better friend than ‘straylya, to quote the butcher of Palestine itself!!! Not as close as Vanuatu but Chinese investment in Sri Lanka is breathtaking (about 6 000 k away). Reclamation work around the port of Colombo – to be followed by massive ‘tourist” developments are simply in the realms of fantasy. … focus of anxiety is Port City Colombo. Construction is set to generate tens of thousands of jobs, and the foreign finance it attracts is seen as crucial to reducing the country’s US$64.9 billion debt burden. Yet critics argue the port may undermine sovereignty and do little to help local business prosper. The government knows winning the argument is not only central to the success of this development, but may determine the limits of future Chinese investment. Sri Lanka handed Hambantota Port to China. A joint venture between state-controlled China Merchants Port Holdings and the Sri Lanka Ports Authority owns the leasehold for the port and 15,000 acres of adjacent land. The deal, in which the Chinese partner holds a 70 per cent stake, has been criticised for undermining Sri Lankan sovereignty. The Chinese are not so much interested in the today but seriously concerned with the to-morrow. While we focus on the tactical (the immediate, foreseeable future)) they are consumed with the strategic (the decades, or centuries to come). no foreign military bases in the pacific? except for us, uk & france. Just another massive dose of hypocrisy. Hopefully China will extend it’s influence and assist us in our aims of revolution. Who is Sam Dastyri working for now? He has a lot to offer, and is quite young so has good access to younger generations. Dutton and bishop will be remembered for their climate change joking about rising sea levels in the pacific. NZ – McClay said the US had military research bases in the Pacific, which had been there since World War II, but no-one would want to see more countries moving military bases, or weapons, into the Pacific. 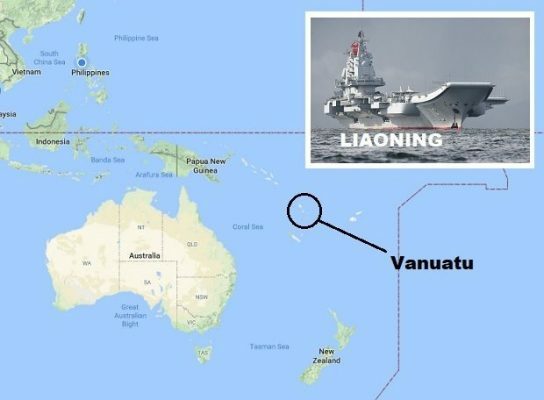 Perhaps china could have a research and training base in Vanuatu??? ps pardon my stupidity but I don’t know of anyone who votes for one party then the other in the senate. Surely a recipe for disaster if you pick the wrong member? pps vanuatu is closer than darwin where the chinese already own the port?? Sadly, Australia is yet to directly confront and overcome our racist and colonial attitude and demeanour to the non-Anglo non-European other both within our own state and without. We don’t even have the self-awareness of the negative perception of Australia and ‘white’ Australians shared across the entire South East Asia / pacific-oceania region. We harbour dreams of uniting and leading the South East Asian states whilst thumbing our noses at them and holding ourselves as superior and master, and expect the boogeyman we dangle in front of them to have the same effect as it has on impressionable children (which, to make it clear, they are certainly not, and are very much aware of the painful politics of keeping Australia on-side and tolerating our attitudes whilst there is no alternative). Then we wonder in shock and betrayed outrage when one by one they peel off as they are offered an alternative, all the while becoming further and further stuck in the pit we’ve dug for ourselves. At some stage it will become painfully obvious with our small population vs the population of our immediate neighbours – especially after they start developing rapidly with the money and resources offered to them by the PRC – our superior dismissive attitude will no longer need to be tolerated. Once they have developed to the level of Singapore they will feel comfortable enough to openly make the same criticism of Australia as Lee Kuan Yew once famously did back in 1980. Prophetic advice we are yet to grow up and consider. With any luck given their history and denigration by the British, perhaps the Chinese will be more respectful to the natives of the pacific region – that may be naive, I hope not because after what they’ve suffered from the various imperialists they deserve a break. Chinese ambitions in the Pacific – what’s driving their agenda? I once spent time with a group of Tibetan refugees and then did some research. The CCP agenda in Tibet – take by force its resources and claim its high altitude plateau as a strategic launch pad. Local opposition was not, and still is not, to be tolerated. To believe the Tibetan invasion has anything to do with the CCP’s purported reason of improving the country’s economy is fanciful. Why did the Solomon Islands capital descend into riots a decade or so ago and why was Vanuatu on the verge of the same a few years back? Denigrate Western imperialism all you like but it is naïve to assume the CCP is acting in the interests of others. Re the PM protesting CCP influence in the Pacific region. The PM has a direct connection to a senior Communist Party official, his son has married into ‘Princeling’ royalty. Now that’s fine as long as the PM’s decisions do not favor CCP entities, but I wonder, how real is his criticism now? News out today: the PM had a $1M stake in a Sydney investment fund run by his son’s friend. The fund boasts that it profits from the demise of big Australian companies. Way to go PM. Two questions – Was one of the Aussie companies hedged for a loss Arrium? Is there a relationship between the PM (or his trusts) to Pacific Hydro and China’s State Power Investment Corporation?